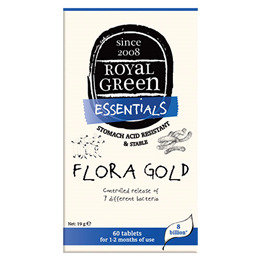 Royal Green Flora Gold delivers 7 different stomach acid resistant bacteria. Contains 8 billion bacteria at production per 2 tablets. Our patented transport technology optimally protects the bacteria and delivers them un-harmed in our body. Flora Gold only contains bacteria that naturally occur in our body. Every human has a great number of bacteria in their colon. Without these bacteria a healthy life would not be possible. You could say that humans and also animals live in harmony with their intestinal flora. A cooperation of which both benefit. Bacteria are there for a good functioning colon and also keep you healthy because they promote the uptake of vitamins and minerals. They support the immune system and are also involved in the digestion, metabolism and bowl movement. If the digestion and food intake is not optimal there can`t be an optimal health. Probiotics can restore the intestinal flora and bring back the balance. Bacteria blend: Lactobacillus fermentum, Lactobacillus plantarum, Lactobacillus acidophilus, Lactobacillus rhamnosus, Lactobacillus salivarius, Bifidobacterium bifidum and Bifidobacterium longum. Fillers: hydroxypropyl methylcellulose and microcrystalline cellulose, gelling agent: pectin, anti-caking agents: sodium carbonate, silicon dioxide and stearic acid, fructo-oligosaccharides (FOS) thickening agent: guar gum, turmeric (Curcuma longa). 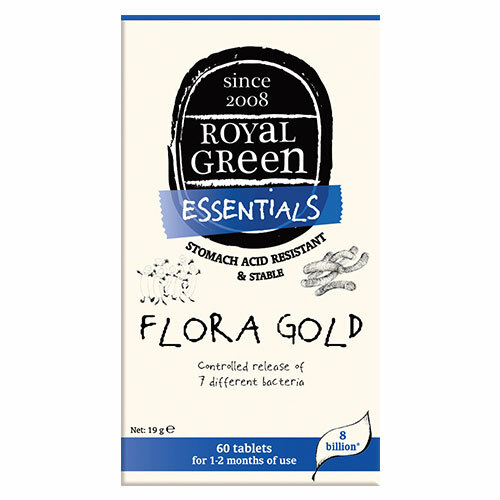 Below are reviews of Royal Green Essentials Flora Gold - 60 Tablets by bodykind customers. If you have tried this product we'd love to hear what you think so please leave a review.